The stainless steel pressure vessel fabrication company will lend its expertise to young professionals at the annual one-day educational event in St. Louis, Missouri. HOLLOWAY AMERICA is a leader in stainless steel tank design and pressure vessel fabrication. HOLLOWAY representatives look forward to sharing information with young professionals about their custom tanks and components as well as their recent SHARP certification. 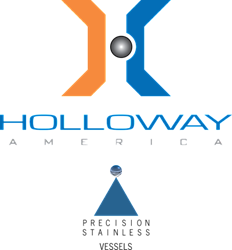 HOLLOWAY AMERICA, a stainless steel pressure vessel and tank manufacturing company, announced recently it will attend the ISPE Midwest Chapter’s Tech Ed Day on Thursday, May 19 in St. Louis, Missouri. The event will be held at the Hilton at the Ballpark near Busch Stadium. HOLLOWAY AMERICA will participate in a vendor showcase during the early afternoon of the event, where the company’s representatives will be available to discuss its pressure vessel and stainless steel tank design and custom-engineered equipment. The fabrication company’s specialization in vessel-cleaning tank components, like its HeavyWall™ CIP Spray Balls, makes it an especially relevant vendor for visiting professionals who may be interested in engineering that benefits sterile production practices for processes related to drug manufacturing, food packaging, beverage production and more. Attendees of ISPE Midwest Chapter’s Tech Ed Day who are seeking a job in engineering for pressure vessel fabrication may be attracted to HOLLOWAY AMERICA due in part to the company’s recent certification for the Safety & Health Achievement Recognition Program (SHARP). Awarded by the Occupational Safety and Health Administration (OSHA), a primary qualification for SHARP certification is a focus on ensuring employee well being. HOLLOWAY AMERICA shares its SHARP status with fewer than 40 other companies in Missouri. “As will be obvious to anyone who connects with us at Tech Ed Day, we recognize that our reputation as an industry has everything to do with the craftsmen and engineers who create our unsurpassed solutions, so we treat and protect our employees accordingly,” said Colwell. The Midwest Chapter of the International Society for Pharmaceutical Engineering (ISPE) encompasses more than 280,000 square miles of the United States. The ISPE Midwest Chapter, of which HOLLOWAY AMERICA is a member, regularly hosts tours, educational programs and social events like Tech Ed Day in Missouri, Kansas, Iowa and Nebraska. For more information on stainless steel tank design, tank components or for details about its Safety & Health Achievement Recognition Program certification, contact Randy Colwell with HOLLOWAY AMERICA at 417.863.0077 or by email at rcolwell(at)HollowayAmerica(dot)com.